NATO bluff called by Qaddafi, rebels' victory facade crumbles. Update: You can't make this up - the International Criminal Court (ICC) now claims it never confirmed that Qaddafi's son Saif Al-Islam was captured. 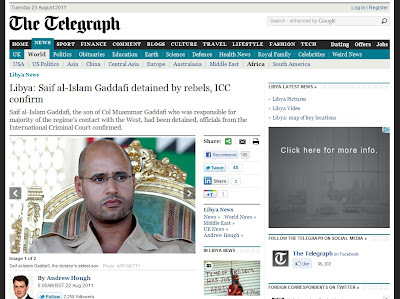 Here is the Telegraph article quoting ICC prosecutor Luis Moreno-Ocampo as having indeed confirmed his capture. Here is a farcical Reuters report now claiming such a confirmation was never claimed. ICC prosecutor Luis Moreno-Ocampo should resign, so should editors at both the Telegraph and Reuters and a myriad of other media agencies complicit in spreading this willful and malicious propaganda. August 23, 2011 - Once again a defiant Qaddafi has prevailed against the full might of NATO aggression including a murderous bombing campaign followed by NATO special forces on the ground supporting mobs of US/UK/French/Qatari backed Al Qaeda thugs which swarmed Tripoli over the weekend. "Illustrious" news agencies from the Qatari government's AlJazeera, to the now exposed frauds at CNN, BBC, Reuters, AP, AFP have been caught perpetuating a concerted war propaganda campaign in order to break the will of both Libya and in particular Tripoli. 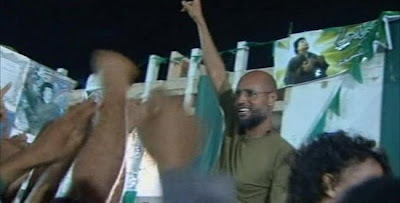 Photo: Taken overnight, Qaddafi's son Saif Al-Islam "confirmed" to be captured and ready to be transferred to the Hague by the illegitimate International Criminal Court, is actually very much free and leading efforts to drive out NATO backed Al Qaeda thugs from Tripoli. Everything we have been told, from President Obama's teleprompter readings to Luis Moreno-Ocampo of the ICC's claims of Saif's "confirmed" capture, to the mainstream media and the Al Qaeda infested "Transitional National Council" are now systematically being exposed as overt, verified lies as part of what may be the biggest psychological operation in modern history. Al Jazeera who was already featuring lofty "The Last Days of Gaddafi" narratives is now forced to face reality and irrefutable evidence that the rebel operations in Tripoli were clearly over-hyped war propaganda and the reality is Qaddafi and the Libyan people have called NATO's bluff. Image: Here, the International Criminal Court "confirms" the now verified lie that Saif Al-Islam was being held by rebels. ICC prosecutor Luis Moreno-Ocampo, in a fit of unmitigated lies claimed, "we have confidential information from different sources that we have within Libya confirming this." He would continue, "it is very important to make clear there is an obligation to surrender Saif to the ICC in accordance with the Security Council resolution." Along with UN Chief Ban Ki-Moon's claim that the "international community" is obligated to comply to the ICC we see unfolding a criminal organization of liars and degenerates of unprecedented proportions. What follows next is unsure. With Council on Foreign Relations president Richard Haas and others calling for an expedient landing of NATO occupation forces it seems they above all others knew just how tenuous the rebels' hold on Tripoli was. As explained previously, the war in Libya goes beyond pilfering the nation's material wealth, it is about establishing the Wall Street-London international order and its primacy over the nation-state. A NATO failure in Libya would infinitely complicate planned operations against Syria, Iran, and along Russia and China's peripheries. While it appears that NATO's last ditch murder spree has failed, with so much on the table, everything from continuous carpet bombing to a NATO land invasion under the guise of UN "peace monitors" or Haas' NATO occupation forces are possibilities already being planned. What we do know is how desperate the corporate-financier elite are and how absolute their control is over the mainstream media. Such a large, wide scale disinformation campaign is only possible if each news agency, from AP, Reuters, BBC, Guardian, Telegraph, New York Times, CNN, Al Jazeera and others, are completely compromised by corporate-financier interests. The following lists show that indeed many of these "news agencies" share consortium memberships with some of the largest corporate-financier interests on earth presenting an immense conflict of interest obviously producing astronomically duplicitous improprieties. It would be a good idea for those following the current NATO murder spree in Libya to abandon any trust in Reuters, BBC, CNN, MSNBC, CBS, NBC, ABC, and any of the "reputable" newspapers wasting paper and space on our nations' newsstands, all of whose fates are tied directly to the corporate-financier interests pinning their hopes on a NATO victory in Libya. Instead, we must commit ourselves to vetting reliable alternative news sources as well as committing ourselves to the responsibility of researching the news of the day on our own. Let this be proof positive as to how essential it is to boycott and replace everything eminating from the Fortune 500 including their army of professional liars also known as the "mainstream media." For more information on Libya, please read through the Libya Archives.